But my device has 16 KByte of SRAM, and I knew I use much less than 10 KByte. So what is the problem? So the linker file defines the m_data and m_data_20000000 range. Because the memory controller of the K20 can access the two areas independently, an object shall not cross that boundary at 0x2000’0000. Consequently, no object allocated by the linker shall cross this magic boundary. The real pain is that the GNU linker is not able to distribute objects into different memory segments :-(. Instead, I need to do this by hand (ahhhrgggg!). The result is that only half of SRAM is easily available on Freescale Kinetis K devices :-(. ❗ The ARM Cortex-M0+ on the Kinetis L series (e.g. FRDM-KL25Z) does not have this memory boundary. There I have the 16 KByte as continuous memory available :-). Now I can use the upper memory area for the RTOS heap, while using the lower half of memory for my other variables :-). ❗ There is still a problem if my heap would be larger than half of the memory. So with this approach an object cannot be larger than half of the SRAM. This entry was posted in CodeWarrior, Embedded, FreeRTOS, K20D50M Freedom Board, Kinetis, Processor Expert, Tips & Tricks and tagged arm gcc, Building, CodeWarrior, codewarrior project, Embedded Component, freedom board, FreeRTOS, global variables, gnu gcc, K20D50M Freedom Board, open source projects, Processor Expert, software, software project, technology, Tips&Tricks, tool chains by Erich Styger. Bookmark the permalink. I am using the FreeRTOS component on K20D50 with success, and as soon as I have seen your post I downloaded your updated components and proceeded with the update in CodeWarrior but unfortunately I can’t see the new option for the memory segment. Is there anything I’m doing wrong in the update/configuration of the new FreeRTOS component? the updated sources are on GitHub, but I have not updated the *.PEupd files yet. I’ll send you the FreeRTOS .PEupd by email if this is ok.
then you just need to ensure that the processor is not crossing that 0x2000’0000 boundary with an access. Then this of course works too. I ran into this on another chip I had selected because it advertises 192K of RAM. Only after I started coding did I discover it’s in a 128K and a 64K piece with a big hole in between. So much for doing that great big malloc() I had intended. Punchline for me — read more carefully before soldering! and should change the init_sp to the low 8k ram top+1 ? FreeRTOS is using the heap for the task stacks. But yes, for the SP during the normal startup code, it would be better if the stack does not cross that memory boundary. looks like iar do not support __attribute__(***) , is there an another for using bank ram in iar ? indeed, I need to change the syntax for IAR :-(. I followed your example. Now it compiles, but somehow the linker does not place the code in the upper SRAM region. What is missing in the linker file? Yes, I just saw that it was not using the name from the properties in the component :-(. I have fixed this now. So it uses now whatever you specify in the settings. Still, for my project it does not place it in the upper SRAM region. Not sure what is wrong. Thanks for all the great components . I found a little problem in the PDG component which drive nokia lcd, if we use freertos and pdg both, there is a little problem in the pdg init, first we disable the interrupt by rtos, then we call the pdg init function following , but pdg init function need interupt enabled by spi, so we will stop on this . Can pdg component add the chiose to chose init the driver in PE or not , we can call the init function in gui task. you don’t have this for the KL25Z, as on the L series the memory is not segmented. So for the KL25Z128 you have 16 kByte of continous RAM, no need to have this. the size of total heap size (8184), after the first task declaration 4000, and at the end i have a FRTOS1_vApplicationMallocFailedHook. Why one task take more than 4000kb if the stack size is 1024? in FreeRTOS, the task stack size argument is *not* number of bytes, it is ‘number of stack adressable units’. The size of a ‘unit’ depends on the architecture. For an 8bit architecture this is a byte, but for ARM Cortex this is a 32bit entity. So if you assign 1024, then this means 4*1024 bytes. Typical values I use are 150 or 200. 1024 is a lot of stack (you will easily run out of RAM as you have seen). Thanks Erich, forgive me but is my first S.O. that i see. good weekend! No problem at all, and glad to help out. I have a FreeRTOS problem, which means my s/w won’t run when I add a new call to FRTOS1_xTaskCreate(). For the KL25Z you do not need to apply these settings: the KL25Z does not have a segmented memory like the K20. If your software does not run after a xTaskCreate(), this sounds like you are running out of heap memory? What is your RTOS heap size? Have you debugged and stepped through your code? Maybe you end up in a out of heap hook? Ignore this. (a) I read that this fix is not required for the KL25. (b) My bug that seemed to be a FreeRTOS memory problem was actually elsewhere. It compiles OK but has error in linking. This means somehow you use too much of that 16 KByte of RAM. So: do you have some extra variables? That project already is using 14868 bytes of RAM. 10000 are reserved for the RTOS, so you might reduce that by 1 KByte so you can link again? i will try again and link this code. this time i will download fresh code from git-hub and try again and let you know soon. As far as I know the only restrictions are that bit-banding is limited to one of them and it is not possible to read/write misaligned addresses across the boundary, nor to perform burst access across it. You write about ‘objects’ but what are these exactly? In the case of variables and structs that are correctly aligned general read/write operations should be possible and so allow the complete memory to be used as if it were contiguous. Which “operations” on which ‘objects’ thus need to actually be avoided?? there is no bit-banding on Cortex-M4(F), bit-banding is a feature of Cortex-M3. And I refer to ‘objects’ from the linker perspective: variables and functions (memory objects with a size >0). If I write 1 to 22000000 bit 0 of 20000000 is set to ‘1’. Therefore I am pretty sure that there is bit-banding (limited to SRAM_U). If your objects are bytes then there is no problem. If they are aligned short words there is no problem and if they are aligned long words there is no problem. Objects made up of these and also aligned are also no problem. 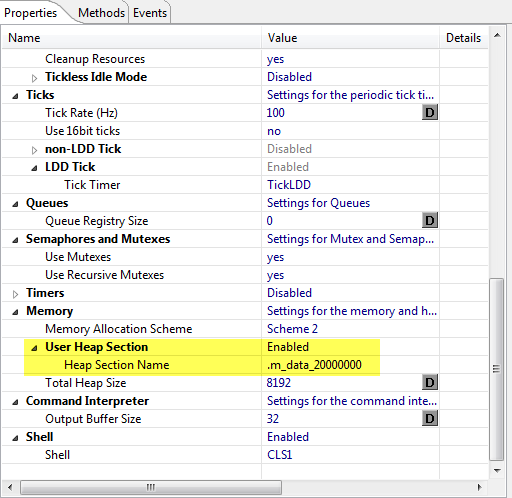 See the following simple test with a memory debugger. 0x1ffffff0 12345678 89abcdef 87654321 fedcba98 .4Vx…..eC!…. 0x20000000 12345678 89abcdef 87654321 fedcba98 .4Vx…..eC!…. 0x20000000 aaaaaaaa 89abcdef 87654321 fedcba98 ………eC!…. 0x1ffffff0 12345678 89abcdef ee654321 666666dd .4Vx…..eC!fff. Only case 5 fails because one bytes of the mis-aligned write is not made in SRAM_U. It also fails for the equivalent mis-aligned long word read across the boundary. This means that there is only a problem when objects contain non-bytes and these are misaligned across the boundary. Although misaligned non-bytes work on the M4 they are not recommended since they slow down the speed of access. Most SW will avoid misaligning such things (it would not be portable code and fail on HW that doesn’t support misaligments) and so most code will have no problem using SRAM_L and SRAM_U as a single block. Code that can’t is essentially non-portable and badly designed code. The KL25Z is a Freescale ARM Cortex-M0+, and does *not* have this segmented memory! Therefore, this post does not apply to this (it only applies to Freescale Kinetis M4(F) microcontrollers. So in your case, you probably just exceeded the 16 KByte RAM you have on the KL25Z. I suggest that you reduce the RAM amount used. Unfortunately, with all my respect, Erich, you’re *wrong* about this. Please read KL25P80M48SF0RM.pdf “KL25 Sub-Family Reference Manual” at page#75 Chapter#3.6.3 SRAM Configuration and please fix your public pages. All Kinetis processors (K, KL, KV, KW, KE, KEA, KM) have SRAM that is partitioned as SRAM_L and SRAM_H, with the partition boundary at 0x20000000. The M4 based parts have different connections with respet to bus master usage of the two partitions and so have different restrictions to the KL parts, which don’t have the same bus architecture. Therefore it is difficult to say what is wrong and what is right because some restrictions are indeen not relevant to the KL RAM. Therefore in some respects it is also correct to state that the segments are irrelevant to one but are relevant for the other. However I think that this topic may be basically misleading because it has its roots in a linker script file which divides the SRAM into two areas, which makes it difficult to handle (by some compilers/linkers). The fact that the linker script had this is another question because in 99.9999% of correct software it is also completely irrelevent to split it, whether working with M4 or M0+. The fact is however that the M4 supports non-aligned RAM access and so splitting the SRAM into two areas allows this to be used without a risk of data corruption since it automatically avoids data structures that ‘straddle’ the two areas, where the M4 ‘also’ doesn’t handle misaligned accesses. Why anyone would want to use misaligned data is a further question since it reduces data access efficiency and generally is bad software design. So my view is that the original linker script was also basically bad linker script design since it was adhering to poor software design. If this had not been there in the first place the compete topic may even have been irrelevant for 99.999% of programmers anyway (exceptions being DMA users doing burst accesses across partitions). The M0+, on the other hand, doesn’t support misaligned access (it will generate a hard-fault if tried) so for such devices the whole discussion is more or less redundant. Misaligned data structures won’t work at on on these parts…. Because as you replied, ALL Kinetis MCU have partitioned SRAM. The the alignment at 32-bit boundary does not guarantee that an array, which is used as DMA buffer won’t cross it. Moreover, I read that the SRAM_L has single-cycle access (from the core), (reminds me the STM32 CCM) while SRAM_U has 2-cycle. So they’re not exactly equal. There is an AN from Freescale on the performance, where their employee recommends SRAM_L to be used for critical code which runs from sram and SRAM_U – for the data. OK, I agree that it is not correct to state that the KL25 doesn’t have segmented memory. 1 – it is a ‘big-hammer’ solution that causes other possibly negative effects (and nasty awkwardness to unrelated things) and still doesn’t guarantee any avoidance of the situation. 2. As you point out, it won’t 100% guarantee that DMA burst transfers can’t occur across the boundary since many SW designs will use such data structures in HEAP (although restricting heap into one the partictions would). 3. I believe that programmers who are making use of more advanced techniques, such as DMA, should be aware of any chip/architectural restictions and control/solve it intelligently (there are many other things to consider when designing with these devices that the SRAM partition) without resorting to a linker script ‘cludge’. – Modified my linker to move the .bss in SRAM_U (6KB on my device). There are also the stack and heap (heap not used, C-code w/o classes, printf doesn’t use malloc()). I am using MK22FN512VLH12 on a simple custom board. I am using KDS with PE components. The compiler went through without any error but linker cause section `.bss’ will not fit in region `m_data’ error. I am not using FreeRTOS to use the configuration mentioned in this post. Could you please let me know how can I address this RAM problem. if you are not concerned about misaligned access, then simply combine the upper and lower half of the RAM into one piece of memory. The only option that I see for changing memory setting is from PE CPU component setting/build options/generate linker file/ROM/RAM Areas. There exist m_interrupt, m_text, m_data_1FFF0400 and m_data. Which one(s) should I change? What is a scenario where a “burst access” would occur across this boundary? DMA transfer? Is that the only case? http://cache.freescale.com/files/microcontrollers/doc/app_note/AN4393.pdf references some cases, but I’m not 100% clear about what else can trigger a burst access. I would imagine that any instruction capable to read multiple data words could cause a burst access. I am using K22F. It has total of 128KB SRAM. Does this mean that if I do not enable _user_heap_section, I will be able to use 64KB at the max? Will the rest of 64 KB go waste? Also what if I enable? RTOS uses upper 64KB and the other global variables, etc will use lower 64KB. Am I right? As discussed in the comments here, it is possible that you change the linker file to have one piece of memory (128 kB). If you enable that FreeRTOS option to put the memory into its own dedicated heap section, it only will move the heap into that section. Everything else remains the same. So ‘normal’ global variables end up in the lower 64 kByte. You might consider as well the FreeRTOS heap 5 scheme which allows you to have multiple heap areas too.